[Fabio Varesano’s] new Arduino compatible board packs a full power punch in a ultra compact layout, measuring at 20.7×15.2 mm, the Femtoduino is probably the smallest 328 based Arduino compatible board around. Most of the staples are present, an QFN atmega328, an MIC5205 low dropout regulator good for a couple hundred milli amps, 16MHz ceramic resonator, reset, power indicator and pin 13 LEDs, but you will need to provide your own serial connection (FTDI, MAX232 etc) and another AVR programmer to get the Arduino boot loader onto the chip. Since the board is small (smaller than a pro mini) it is not directly breadboard friendly. Even though the hole spacing is 0.05 inch, the size is large enough for “normal” wire to fit into fine, if you wish to use 0.1 inch spacing there is a handy break out board you can make where the Femtoduino just snaps in. Everything needed to make one of your own is provided on the website, schematics, kicad files, bill of materials, Gerbers for both the board and the breakout board, though we would like to see this as a pre-made board soon, join us after the break for a video and see why. DO WANT! WANT IT NOW! Awesome but how much will it cost? In Italy, Arduino is a fever. our blog started a contest Febbruino (Arduino gratis>) and everyone love it! finally i can stop deadbugging arduinos! This is great, but not really good for prototyping since it is on 0.05″ spacing. As the creator states it was meant to be used in the final assembly of a project. So what it needs is a programming board made from pogo pins, and the perfect prototyping platform for this module would be a SMT grid on the bottom side similar to Surfboards but SO pitch or smaller. Wouldn’t you prototype with an Arduino Uno? This isn’t meant for prototyping, it’s for people who need the smallest/lightest possible Arduino-Uno compatible board. You lament that is not a protoboard piece, but there are already many many such ‘duinos you can buy… why ask for 1 more? As noted, this is a deployment board however it CAN adapt to a prototype .1 pin. So you get the best of both worlds, actually. I’m not sure what you are missing here.. This is great to take a concept that has been prototyped on a normal Arduino and put it into production. I plan on doing something similar with a whole host of products. Get it operational then put it in production on a smaller, less expensive platform but retain the exact same functionality and modularity. THIS to me is one of the major advantages of the Arduino platform. What this solution needs are snap in pins or some other mechanical connection that are reliable enough (and small enough) to be machine built (so they are cheap) but once you snap them in, they stay connected and are reasonably as secure as soldering. That way, you can quickly turn these into a final production part. Snap the sensor and output array on – hook up power and embed away. Otherwise, you wind up having to hand solder these – and that’s no fun unless you work for $0.40 per hour in China and even then the fun part is debatable. @Cool! – Yes it’s NOT for prototyping because if it was it wouldn’t be so small. Using an adapter to turn it into a Arduino Mini is ridiculous, just prototype with the Arduino Mini, or any other number of bare bones solutions. If you use an adapter, you have to solder headers into the Femtoduino, and then when you are done prototyping you now have headers soldered into it which may not be desirable for your end application. This is meant for final integration on a small scale (think – wire it directly in… no headers), and can be somewhat aided by my previous suggestions. Even with the break out board it is among the smallest Arduino’s I have seen. Very nice! Even though it’s an Arduino, in this form factor, it’s extremely useful. 1.27mm spaced pins are a real pain, but the pins really are the limiting factor for such things. Now can they make it smaller? it still is just an ATmega328 on a breakout board. Completely agree. Build looks nice, it even has regulator like other arduinos, but for me difference between arduino and “controller on a breakout board” is that i can plug arduino in usb without much needs like external programmer. Not that i doesnt have that one – but what about those who doesnt? 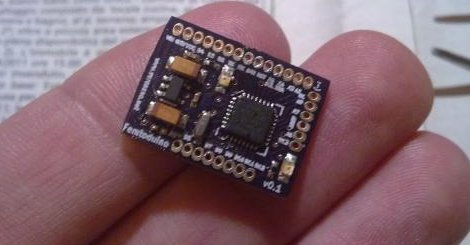 There are also things like Teensy 3.0 in similar formfactor if the size is what you look for in this project (and it is usb-enabled). Yes, we shouldn’t compare them but what the hell. Thanks hackaday editors for posting about my Femtoduino project. Thanks everybody for liking it and giving your suggestions. Much appreciated. Wow I think this may be small enough for a mini-brute sized data logger for model rockets. If the layout can be tweaked just a couple of millimeters narrower, this could fit inside a hollowed-out LEGO brick. I wonder if they could shrink it down more by going with a multi-layer PCB; putting most of the components other than the processor on the back of the board; and wrapping some of the pads around onto the fourth side. @colecoman – Yeah technically it can be as small as a 32 pin QFN chip. Just deadbug one of those! However, you’ll be hella-pissed trying to solder connections to it. I’m not sure I understand the logic behind building an adapter board to breadboard something like this. It’s just a 328 right? If you want to prototype it then all you need is DIP chip and a resonator (or crystal plus caps). Electrically what is the difference? Later, at final build time, if your final application calls for actually using a form factor this small, then you get a femtoduino. Although.. actually.. if you need that kind of miniturization you are probably better off designing and having a custom board made that includes both the 328 and all your other components that aren’t part of the Femtoduino. Otherwise you are just losing space wiring pads on one board to pads on another. Put it all one one board and both the pads and wires are unnecessary. The more I think about it, I can’t think of an application where a femtoduino makes any sense.